Praeger, 1973. Hardcover. Acceptable. Disclaimer:A readable copy. All pages are intact, and the cover is intact. Pages can include considerable notes-in pen or highlighter-but the notes cannot obscure the text. The dust jacket is missing. At ThriftBooks, our motto is: Read More, Spend Less. Praeger, 1973. Hardcover. Good. Disclaimer:A copy that has been read, but remains in clean condition. All pages are intact, and the cover is intact. The spine may show signs of wear. Pages can include limited notes and highlighting, and the copy can include previous owner inscriptions. The dust jacket is missing. At ThriftBooks, our motto is: Read More, Spend Less. Praeger. Used - Good. Former Library book. Shows some signs of wear, and may have some markings on the inside. Toronto: Griffin House, 1973 A nice, tight and clean copy. Dust jacket is bright, but has three minor, closed tears. Price is clipped from dust jacket. Gift inscription on title page. This is one of the best survival adventure stories. The Robertsons are attempting a circumnavigation when their yacht is sunk by killer whales in the Pacific Ocean. With very few provisions, an inflatable raft (which later sinks) and a dinghy the Robertsons are able to survive 38 days on the ocean under extreme conditions. 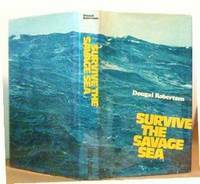 Dougal Robertson's account of the adventure is gripping, at sometimes understated and brutally honest. Robertson was probably not an easy man to get along with but his indomitability, his command presence and force of will, coupled with his wife's emotional strength, got their family through. It is a tremendous story of leadership under the most extreme circumstances. Toronto: Griffin House, 1973. Book. Very Good. Hardcover. Canadian First. spine cocked, edge wear, shelf rubbing to jacket. Toronto:ON: Griffin House, 1973. pp.223. At 10 a.m. on June 15, 1972, the 19 ton, 43 foot schooner Lucette sailed by a Scottish ex-farmer and his family was attacked by killer whales in the Pacific, and sank in 60 seconds. clean tight copy d/j front top small nick and tear on corner, top spine small tears/creases, back top small tear, slight soiling to all edges. Hard Cover. Near Fine/Very Good. 8vo - over 7¾" - 9¾" tall.